Beijing - Chicheng: take metro line 4 or 14 to South Railway Station. After getting off, you may head north onto Nanzhan Xingfu Road. Go along the road for 500 meters (550 yards) eastwards to Yongdingmen Long-Distance Bus Station. Buses bound for Chicheng are available at 06:20, 07:00, 08:00, 09:00, 10:00, and 11:30 in the morning. You will arrive in Chicheng after 5 hours. Zhangjiakou - Chicheng: take bus 2 or 10, or Xuanhua bus 3 or 4 to Changtu Qichezhan stop. Then walk northwards for a few yards to the Zhangjiakou Passenger Station. There is only one bus a day, heading for Chicheng at 06:40. The bus ride takes around 2 hours. Upon arrival, charter a car in front of Chicheng Bus Station to visit Yunzhou Reservoir, Dushikou Great Wall, and Vestige of Bingshanliang Ancient Glacier one by one. After returning to Chicheng, reverse the trip back to Beijing or Zhangjiakou, and this one-day Dushikou Great Wall hiking tour will end here. 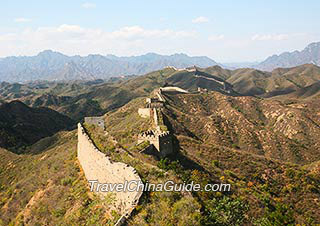 Dushikou Great Wall: This section was completed during the reign of Jiajing Emperor (1507 - 1567). Unlike other Great Wall sections like Badaling and Mutianyu with stairways, ramparts and crenels, you can only find a single wall piled up only by flagstones at Dushikou, stretching along the rolling hills to the distance. Although not using adhesive, it was still a solid defensive line which had warded off several invasions of northern nomads and has been well kept until today. Vestige of Bingshanliang Ancient Glacier: This whole scenic area is located at an elevation of 2,300 meters (7,500 feet) and occupies an area of 10 square kilometers (4 square miles). Due to thousands of years of wind and glacier erosions, stones here are weathered into various shapes, such as toad, turtle, lion, and hen. You can also find stone mortars on these rocks with the largest of a diameter of one meter while the smaller one can be only of a dozen centimeters in diameter. 1. 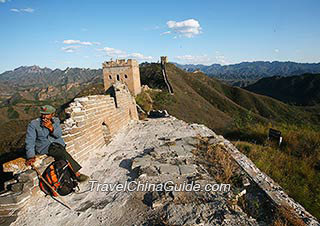 If you leave from Beijing, it might be a little tight for you to finish the whole backpacking tour in one day. You may stop at Dushikou Town at night to find a hostel for one night's stay, and do the unfinished trip the next day. Additionally, hills around Dushikou are of a gentle slope and covered by meadows, so setting up a tent around Dushikou Great Wall can be a cool idea for campers. Make sure you well nailed down the tent to the ground, as the wind might blow hard. 2. Located at a high altitude of 1,700 meters (5,600 feet) and 2,300 meters (7,500 feet) respectively, Dushikou Great Wall and the Vestige of Bingshanliang Ancient Glacier are exposed to the strong ultraviolet radiation. It is suggested you wear long-sleeve clothes and sunscreen to avoid getting sunburned.